Often described as Of Mice & Men’s backbone, Valentino Arteaga shines with this aura the second you meet him. Sitting down with the tenacious drummer, he explained the mentality of Of Mice & Men, and contributing to their growing success in the music scene. From being on top of schedules and acting as a moral compass to the band, Tino proudly elaborates on his role with a reflective song lyric. “‘Taking care of business’ – that’s how I look at things. Things have to get done and you just got to do it.” Ever since Arteaga was young, his parents instilled an organized and responsible character in him, teaching him, “If you want something, it will never be handed to you; if it is, maybe you should have worked harder to get it.” This outlook epitomizes the band’s effort to soar through the musical boundaries of Warped Tour labels and break out into a style that suits their intuition. When creating their third studio album, Restoring Force, the challenge to sit down and actually think about what they wanted to sound like seemed like a new frontier to Of Mice & Men. After excessively touring for years, 2013 became the time for Of Mice & Men to regroup and recognize their growing success in the music scene. Their first two albums were simply seen as touring material – the juice to keep the passion of their fan base secure and strong. As I particularized in my past Of Mice & Men editorial, it was time for the band to take advantage of the metalcore following they’ve reeled in and create something they truly believed in. “Being able to finally create an album that really personifies our band is a sound that we are very proud of and very excited about. It really took a couple albums to get to that point, and now that we’re here, we know how to access our sound and how to access those ideas from this point on,” Arteaga recalled. The slower change of pace in the studio they were exposed to with producer David Bendeth allowed them to think about their musical skills more than ever before, resulting in the bigger, broader sound they debuted on Restoring Force. With the addition of bassist and vocalist Aaron Pauley to the band, it seemed as if he was the missing puzzle piece to their songwriting potential. Writing and recording Restoring Force brought out the best in frontman Austin Carlile once Pauley was at his side. “I love that our band has Aaron and Austin, who are chorus writing geniuses because they don’t stop at just one thing – they work on different parts and see what is going to sound the best with different ideas. There never used to be that much thought put into it, but now we challenge ourselves more to find things that make us go ‘WOW,’” Tino boasts of the band’s powerful songwriting duo. The passion that Tino Arteaga has for music is almost tangible when talking to him; this mindset is shared throughout the whole band as they actively share this love with the people who feel closest to them through it: the fans. On their biggest headlining tour to date, their VIP sessions have been thoughtfully spent hanging out and chatting with their fans, even exposing them to the music they felt a connection to. Arteaga explains, “We even have a playlist that we made of bands we think our fans should listen to during the VIPs. I think it’s cool to show our fans and talk with [them] about the music we love.” This is where Of Mice & Men find sense and happiness within their fan base. They are not bigger or better people than the ones who come to their VIPs, but equal, united music lovers sharing their passion to anyone who is willing. This beauty of music is incredibly powerful, but is sometimes overshadowed by the new ways of communicating via the Internet. Fans now have greater access to the personal lives of their favorite musicians, leading to a concerning involvement in the lives of these people, whose personal lives they have no business commenting on. 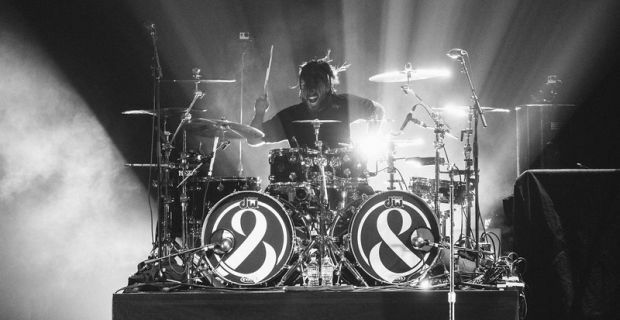 The sole purpose of music is going to keep Of Mice & Men on top of their game for years to come. The goals Arteaga has for their music are large, but quite feasible for the headstrong group. Of Mice & Men are no longer looking to get by; they want to make change within their hard rock status. “We want a typical Of Mice song to be anything. We don’t want to have to typecast to a certain genre.” Restoring Force is the new era of the band that proves that they are more than just a Warped Tour headliner, dropping breakdown singles like the same tired machine. This time they are looking to impress themselves and the people that matter. Fans have been secured with the fact that this new era is written in stone after the release of Of Mice & Men’s recent reissue, Restoring Force: Full Circle. The three new singles reinvent the band at their finest, radiating pride and confidence as they turn their influences of their high school heroes like Linkin Park and Slipknot into their own revival of hard rock. Arteaga dives into the easygoing process of supplementing Restoring Force when stating, “This time around we really felt way more comfortable with it. It was more conducive to the creativity, and that’s why we felt it came full circle, because we were back again in the same place with the same team and being able to create new songs with these new fresh ideas that we had just written 9 months prior of Restoring Force. Being able to record this new chunk of music was like a full circle experience.” This sense of comfort and enjoyment shines through the reissue; “Never Giving Up” blasts with nu-metal energy and chugging instrumentals and the hit “Broken Generation” conveys themes and ideas that really make you think about how you’re living your life. Like it or not, this is the strongest place the band has been in so far in their promising career. After years of rushed work and reluctance, Of Mice & Men have finally found their stride. This is the first chapter of the band Of Mice & Men wants to be, but certainly not the last.